This book entitled simply Duck Hunting is intended to bring the sport into the twenty-first century. In order to be a successful duck hunter, you must first have a decent grasp of duck biology. 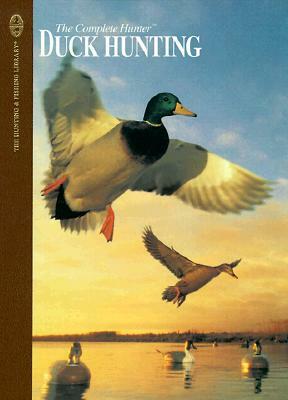 This book shows you how to recognize good duck habitat and understand the birds’ breeding behavior, food habits and migration patterns. It also includes biological profiles and excellent color photographs of every important North American duck species, both hen and drake. Duck hunting is and equipment intensive sport. This book will tell you what you need in the way of shotguns and shells, decoys, duck calls, blinds, boats, clothing, accessories and even hunting dogs. Then, it will thoroughly explain how to put this equipment to the best use. The highlight of this book is the section on duck hunting techniques. Unlike any other duck hunting book available, this one shows you exactly what to do in a wide variety of specific situations, from hunting puddle ducks on potholes to divers on big water. It explains how to set your decoys and place your blind according the the wind and what guns and ammunition to use. It also gives you some technique and equipment oriented tips that are sure to make your hunt more enjoyable and successful. As long as we have an abundance of water and good nesting cover, duck populations should continue to flourish. It doesn’t matter if you are a newcomer anxious to enjoy some exciting wing shooting, a veteran waterfowler who gave up the sport or a die hard who stuck with it, this book is designed to be used as your guide to the new world of duck hunting.